Many approaches have been proposed in the fuzzy logic research community to fuzzifying classical geometries. From the field of geographic information science (GIScience) arises the need for yet another approach, where geometric points and lines have granularity: Instead of being “infinitely precise”, points and lines can have size. With the introduction of size as an additional parameter, the classical bivalent geometric predicates such as equality, incidence, parallelity or duality become graduated, i.e., fuzzy. The chapter introduces the Granular Geometry Framework (GGF) as an approach to establishing axiomatic theories of geometries that allow for sound, i.e., reliable, geometric reasoning with points and lines that have size. Following Lakoff’s and Núñez’ cognitive science of mathematics, the proposed framework is built upon the central assumption that classical geometry is an idealized abstraction of geometric relations between granular entities in the real world. In a granular world, an ideal classical geometric statement is sometimes wrong, but can be “more or less true”, depending on the relative sizes and distances of the involved granular points and lines. The GGF augments every classical geometric axiom with a degree of similarity to the truth that indicates its reliability in the presence of granularity. The resulting fuzzy set of axioms is called a granular geometry, if all truthlikeness degrees are greater than zero. 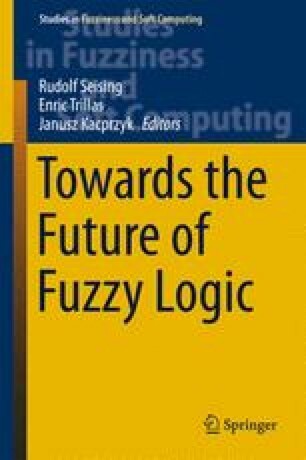 As a background logic, Łukasiewicz Fuzzy Logic with Evaluated Syntax is used, and its deduction apparatus allows for deducing the reliability of derived statements. The GGF assigns truthlikeness degrees to axioms in order to embed information about the intended granular model of the world in the syntax of the logical theory. As a result, a granular geometry in the sense of the framework is sound by design. The GGF allows for interpreting positional granules by different modalities of uncertainty (e.g. possibilistic or veristic). We elaborate the framework for possibilistic positional granules and exemplify it’s application using the equality axioms and Euclid’s First Postulate. Most of the work is part of the author’s PhD thesis and was produced while having been employed as a research assistant at the Research Group Geoinformation at the Vienna University of Technology. It was supported by Scholarships of the Austrian Marshallplan Foundation and the Vienna University of Technology. The author would like to thank Prof. Andrew U. Frank, Dr. John Stell and Prof. Lotfi Zadeh for their continuous support and inspiration.